Paolo Carozza, professor of law at the University of Notre Dame, participated in the second seminar of the Catholic-Muslim Forum on Nov. 21 and 23, held at the site of Jesus’ baptism in Jordan. 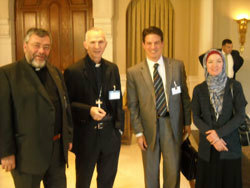 Carozza was one of 24 Catholics invited to attend the seminar by the Pontifical Council for Interreligious Dialogue, headed by Cardinal Jean-François Tauran. Twenty-four prominent Muslim religious leaders and scholars also attended, led by H.R.H. Prince Ghazi bin Muhammad of Jordan. “The seminar offered us a deep and challenging discussion over three intense days, in which our differences were addressed with sincerity, respect and friendship, and in which we also found much that unites us, particularly our common acknowledgment that the inviolable, God-given dignity of the human person demands recognition and protection,” Carozza noted afterward. At Notre Dame Law School, Carozza is the associate dean for international and graduate programs, director of the Program on Law and Human Development, and interim director of the Center for Civil and Human Rights. 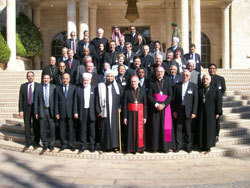 More information about the Second Catholic-Muslim Forum delegations is available here. Originally published by Susan Good at law.nd.edu on December 09, 2011.